Yes, I finished successfully. 50,000 words, and I did it in 29 days. Still can’t believe it myself. It’s rough and it’s ugly, and I’m not really sure that it’ll ever see the light of day, even though I’ve had a couple of requests to read it, but I got the words out of my head and into the computer. 50, 016 words in all. There are a few sentences in there that I really like, but a lot of it is just words. The characters developed a mind of their own, which proved to be a good thing since they drove the story further than I would have been able to on my own. All in all, I’m proud of the effort. So, what’s the point you might ask. There’s no real reward. You can download the picture you see above, and there’s a certificate you can print out, and swag like t-shirts and stickers that you can buy. But what do you really get out of NaNoWriMo? Well, other than the pride of being able to say you did it. I actually know two people who have published multiple books that started with NaNo ideas. I don’t know if mine will go that far, but that’s ok. I do hope that I will carry this writing bug forward to finish a couple of articles that I’ve been wanting to submit to magazines for a couple of years now, articles that have languished on the computer while I’ve dithered about doing other things. And it’s amazing how being creative in one way feeds your creativity. I’ve designed and knit 4 pairs of socks and started another pair last night. I’ve finished one lace shawl and started another (ripped the second one out after 100 rows because the idea in my head wasn’t working the way I wanted. I’m up to row 70 again and the new design is working great. Pics to come when they are blocked). I’m through the first repeat on the fair isle sweater. I’ve posted here. Doing NaNo didn’t stifle me at all. It didn’t take all my words or all my creativity. That kind of surprised me. I was able to take time off from writing during the month. Spent time with friends and family, went to the movies a few times and watched a lot of Netflix, shopped as much as my back and budget would allow. I had a fairly good month (if you ignore the pain), and I got through it. Yep, snow. It has been snowing most of the day so far, with a little break that I took advantage of to get outside and feed the beasties. Really glad I filled all the waterers yesterday and rolled the hose up, a chore I had put off as long as possible, not quite willing to admit that winter is here. No denying it now. It’s not the earliest we’ve ever gotten snow, but I don’t enjoy the extra work it brings. If the wood would just bring itself in to the house so I could enjoy the wood stove that’d be great, and if it wasn’t such a huge battle to keep the hose clear of ice. A girl can dream, right? I know, I know, normal people dream about having expensive sports cars and mansions. I dream of heated hoses (you knew they make those, right?). I’m a sheep farmer. A new barn, full of good hay, that’s the stuff that makes my knees weak. A bunch of us talked once about what we would get if we won the lottery, and the consensus seemed to lean towards new pick-ups and matching stock trailers. Be still my foolish heart! NaNo continues. I’ve slowed a bit, but I’m still at over 28,000 words. I can hardly believe it. The story has taken on a life of its own. I go to sleep thinking about what I’m going to write the next day, but once I start writing the characters seem to have their own ideas. They are currently traveling across country in a horse-drawn wagon (it fits, since it’s a pre-industrial society). Last night I figured that I’d write about the area that they are traveling through, fluff mostly cuz I’m under pressure to come up with another 22,000 words. Today my heroine is charging a pack of wolves on horse back, yelling at the top of her lungs. Who knew she was so feisty? 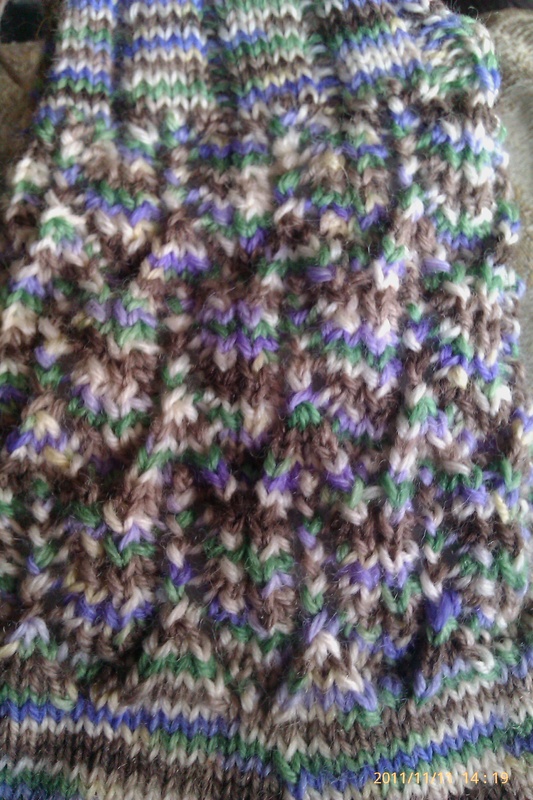 The main color is still off in this pic, but that’s the first repeat of the fair isle pattern. There will be four repeats in the body of the sweater, so it feels like I’m really getting somewhere. I know I’ve still got a long way to go, but at least I’m getting some done. Laura has been nice enough to defer to my opinion on the few things I’ve asked about, so that’s nice. I think it’s going to be really nice once it’s blocked. Really glad that I redid the corrugated ribbing, cuz my gauge is spot on now. After NaNo I’ll be alternating this with reading the latest Stephen King book, which I’m not letting myself start until I’m done with writing this month. I’m a huge fan of his, and I am really looking forward to this one – how would things be different if JFK hadn’t been shot. I’m also excited that Thanksgiving is next week. Turkey is thawing in mom’s fridge. I’ll bring it home to brine and cook closer to Thursday. She hates the mess, and my oven is bigger anyway. Plus it is my bird. We all get together at her house, because it just works better for gatherings, but we all cook and bring stuff, so it doesn’t all fall on one person. Much more enjoyable for everyone that way. If I don’t talk to you before then, I hope you have a great holiday and enjoy the ones you spend it with. Stay safe all! Shepherd Suzy over at Juniper Moon Farm posted yesterday about how we women speak to and about each other. She’s right that we are often more cruel with each other than the men in our lives would ever think about being. And many of us struggle with how to deal with it when we see it happening. Sometimes it’s hard to speak up when you are faced with offensive behavior. It feels awkward sometimes, even when you know it’s the right thing to do. I’m not saying you should put yourself at risk (and neither is Suzy). But we all need to be more supportive of each other. Quit saying nasty things about someone who isn’t there to defend herself. Quit encouraging skinny friends to diet and telling not-so-skinny ones that they need to diet at all. Learn to speak up for yourself. Speak up when someone with you is doing those things. Let’s stick up for each other people! Think what your world would feel like if you felt more accepted. Spread the love! We could all use a little more of that, and a little less negativity. I remember as a teenager always being dragged along for the ride every time my mom decided to go on a diet, and I never really thought about the message that was sending to me. Didn’t think about my weight much at all growing up. I did as I was told. When Jo was in 3rd grade her teacher would pick a kid every week as “student of the week”, and that kid would bring in pictures and stuff that were important to them. Jo did a poster board. I gave her some pictures of me as a teenager. The teacher asked her who they were of, and that made me realize how much I had changed. Not just aged, mind you, but physically changed. See, in high school I weighed about 120 pounds, solid muscle. Way more than that now (3 kids will do that to you if you’re not careful!) Never dawned on me that I didn’t need to be on the diet with my mom, or what that might be doing to my body. I’m okay with how I look. I’ve earned every grey hair and wrinkle. My weight has held steady for at least the last 10 years (and probably closer to 15). My cholesterol levels are great, my blood pressure is acceptable, I’ve seen the ultrasound they did during a stress test and there is no plaque to worry about. I’ve never really understood American women’s obsession with make-up and clothes and all that girly stuff. Give me a comfortable pair of pants and sneakers, and a big t-shirt and I’m good. You wanna wear that other stuff? Have fun, but don’t bad mouth me because I don’t. And I’m not afraid to say that to your face. Hey, in case we haven’t been introduced, I’m Sue, and I’m brutally honest (and yes, a friend actually introduced me that way once!). NaNo continues. I’m up to about 17,000 words, which sounds like a lot already, but I’m actually behind schedule by over 1,000 words. At least my story hasn’t bailed on me completely, which has happened every year so far. I’m using the writing to try to deal with some personal issues, including Jo. Kind of amazing that even just writing about the death of my main character’s daughter makes me cry. Too close to home I guess. Still, it feels good at the same time, so I keep writing. I’ve actually jumped around a bit, and have already written the last paragraph! I know where I want the story to start, and I know how I want it to end. It’s just a matter of letting the characters figure out how to get from point A to point Z. Here’s hoping they cooperate with me! I’ve been doing some knitting too. Had to rip out the progress I’d made on the purple socks. The pattern just wasn’t working at all, so I’m going to have to re-figure that. I love the lace, but not everything works when you try to do it in the round. Just wanted to get them knocked out, so went back to an arrow pattern that I’ve used before. Brain power is mostly being co-opeted by NaNo and meds, so I’ll do the math later. I do think it’ll make pretty socks if I can get it right. I also started the last pair that I am doing for my friend. This pair is for the baby, who will be about 14 months old at Christmas. 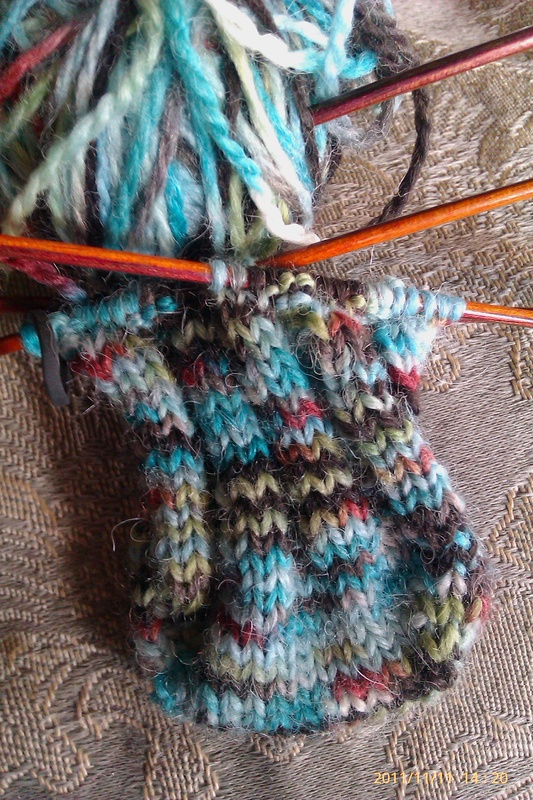 I’m using some leftover sock yarn from KnitPicks that has alpaca in it. It’s just a simple 3×3 ribbing tube sock. I also took a break from writing to start thinking about the sweater that I’m knitting for Laura‘s sister. She had sent me an excel document that she had put the colors actually being used into, but it was just a single repeat of the pattern. Since I can be a bit compulsive about things like patterns looking good I re-charted the whole thing. I found a couple of mistakes in what Laura had sent, so I kind of went ape on it. 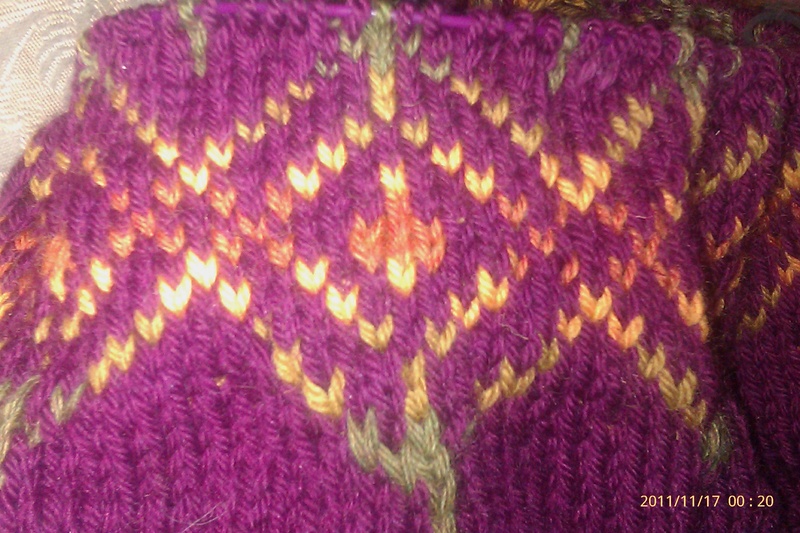 Now I have the whole fair isle part of the sweater charted, colors all in the right places, center front balanced. Luckily her sister does not want the fitting that the pattern contained, which works much better to maintain the integrity of the pattern. It starts with corrugated ribbing, which I have always liked. I actually ended up ripping this out, since I apparently relaxed more than I had thought while knitting this after my meds. My gauge is WAY off, so out it came and I’ve started over. Oh well, I’m a process knitter, so starting over isn’t the end of the world to me. I want the finished project to be right whatever I’m knitting, and I’m almost always ok with ripping or frogging to get it right. Project knitters feel differently, and can take it very personal when they get done with something and it didn’t work out. My philosophy is that as long as I enjoy the yarn I’m working with I’m ok with getting to work with it again (and again, and again sometimes). At least all the math is done, so I just have to pay attention to my tension and it will all be ok. 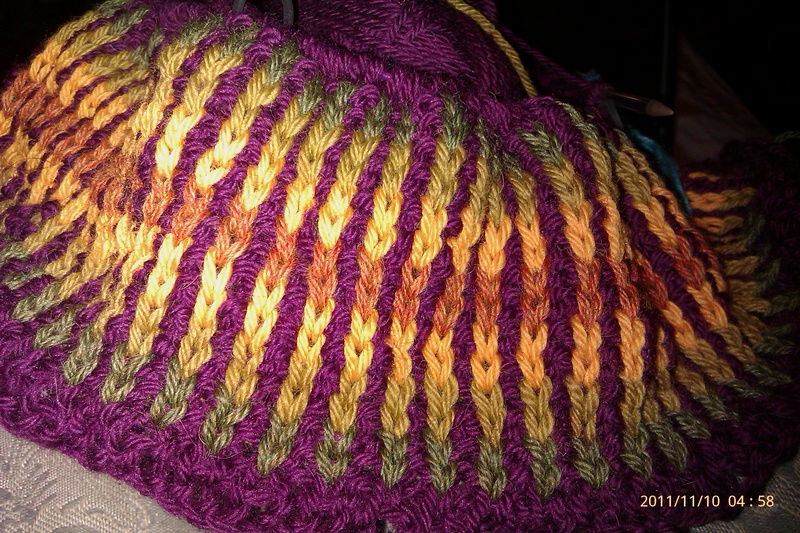 I think it will be a very pretty sweater when it’s finished. Warning: This post is a bit picture heavy. I said the other day I was going to make turkey soup, and today was the day. The weather had taken a turn towards winter, and while it alternated blowing, raining and snowing, I went to work. 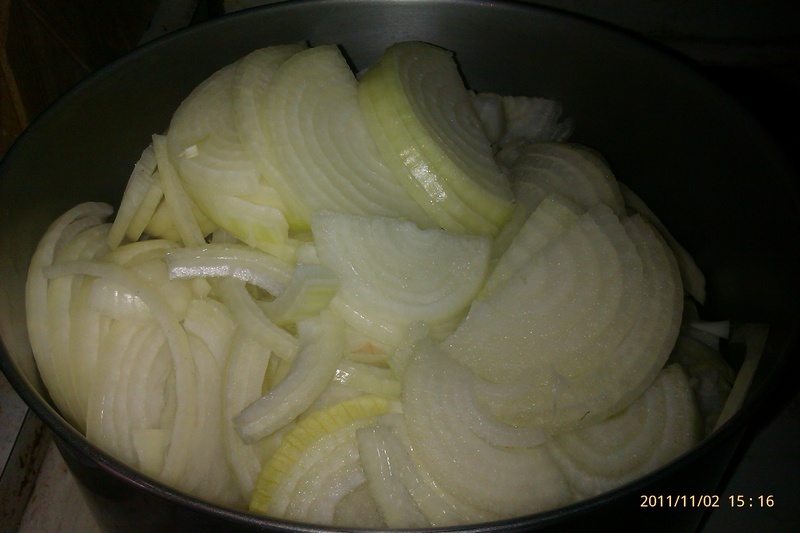 I actually started yesterday afternoon with caramalizing onions. I do this very, very slowly. I know you can brown onions in a few minutes, but I love how they turn out when I really take my time. Started with a 10 pound bag of yellow onions that I got from Costco. 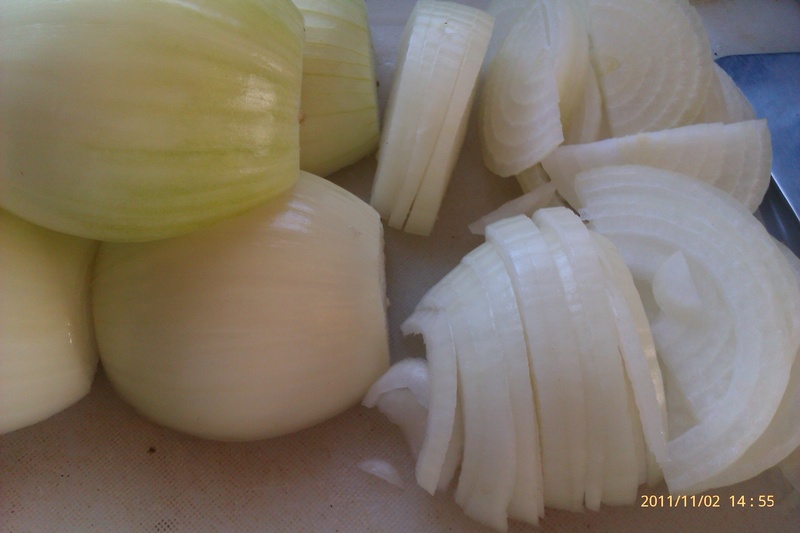 One onion went into the pot of ratatoiulle that I made a few days ago, and one at the bottom of the bag had gone bad, but the rest got sliced thinly. While I was slicing I started melting a stick of butter and some olive oil in the pot. The approximately 9 pounds of onion were enough to nearly fill my big stock pot. As much time as this takes, it’s worth doing a ton of them at a time. I just stir the pot when I happen to walk thru the kitchen. They weren’t finished when I went to bed so I just turned off the stove and covered the pot (this time of year my house stays pretty cool at night, so I knew it would be ok). I cook them on very low heat and stir occasionally, so while it takes forever it isn’t very labor intensive. I had to get up very early this morning (more on that later), so I finished cooking them today. When they are done I always celebrate with an onion sandwich. Yes they are that good! Most of the rest get put into the small bags in the freezer so I have some available to add to other dishes. One small bag went into the fridge, and the rest were left in the pot. 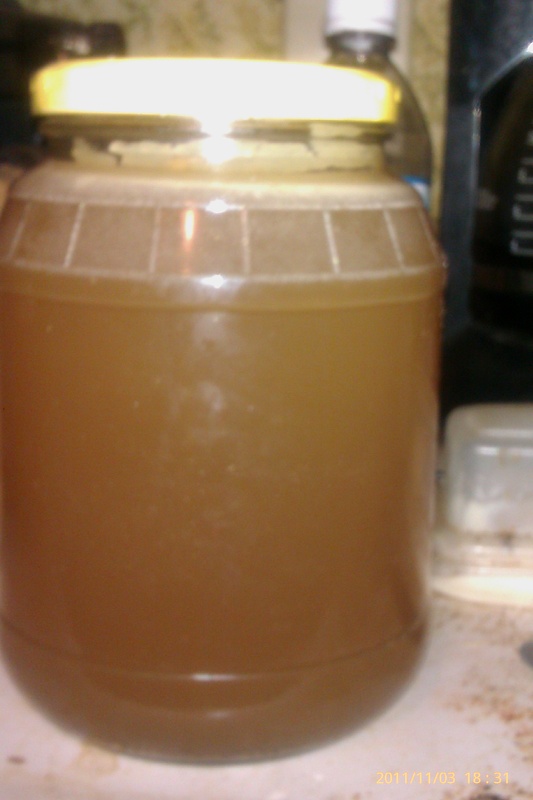 This is a picture of the whole finished batch, about 1/4 the volume that I started with. They need to sweat for a long time and get rid of all the water before they can start browning. They are so sweet it is absolutely unbelievable. 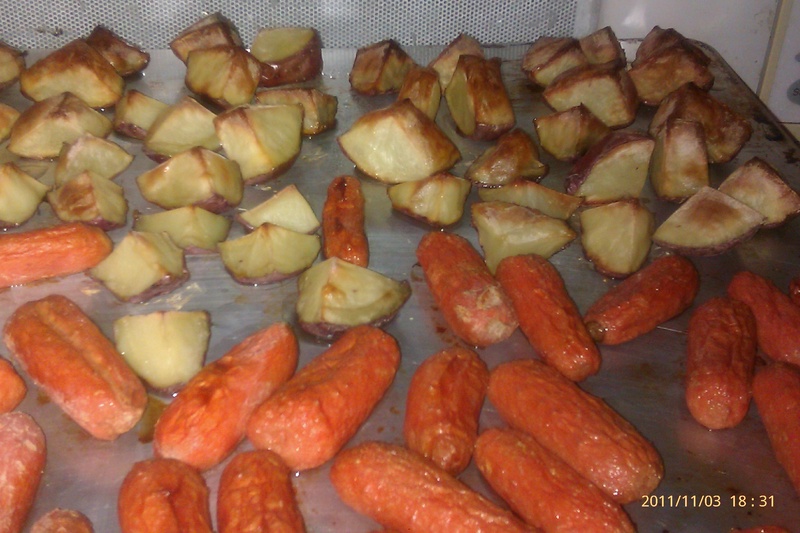 While they were finishing up I rough chopped some red potatoes I had and I drizzled them and some baby carrots with olive oil and popped them into a hot oven to roast. This is how they turned out. I love the flavor of roasted veggies so much more than boiled. I ended up slicing the carrots in half to make them more bite size. 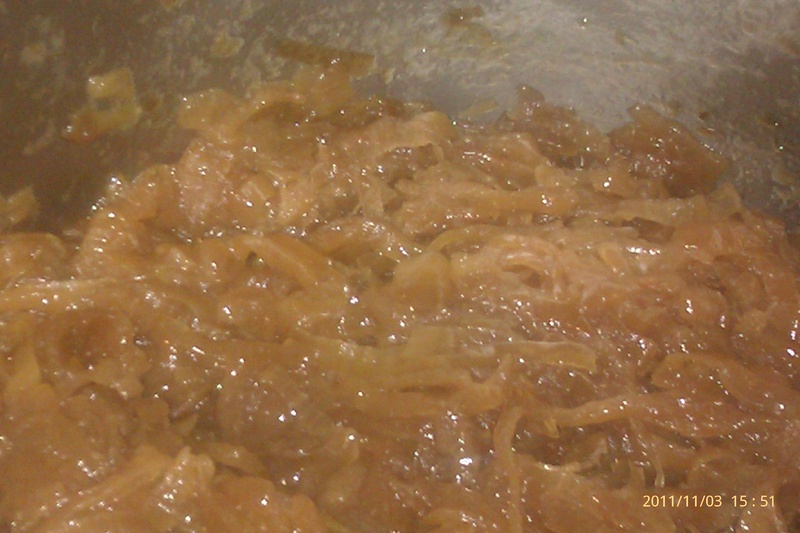 They joined the onions and the smoked turkey stock in the pot to start heating up. It was amazing how much meat had been left on the carcass. Glad I hadn’t tossed the whole thing without looking at it. 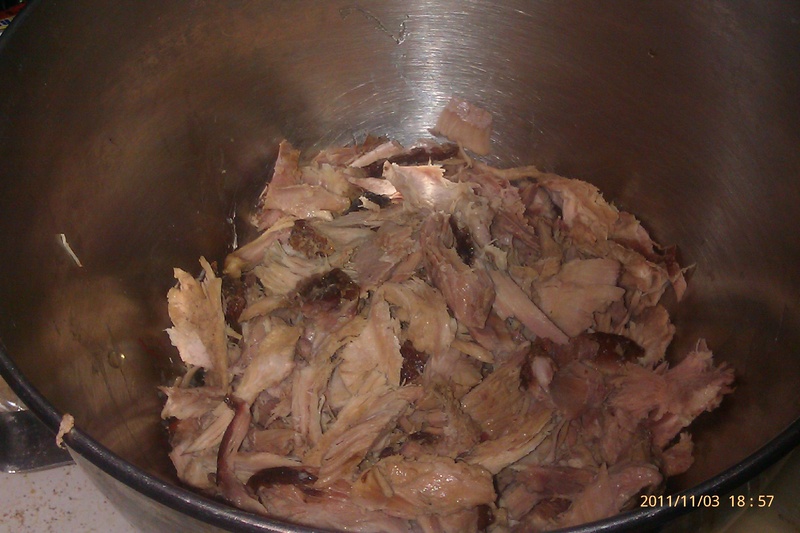 A nice thing about using smoked meat was that it hadn’t dried out while I was making the stock. I’ve had that problem with chicken stock in the past, and to me the meat that has cooked with the bones becomes unusable in the soup. 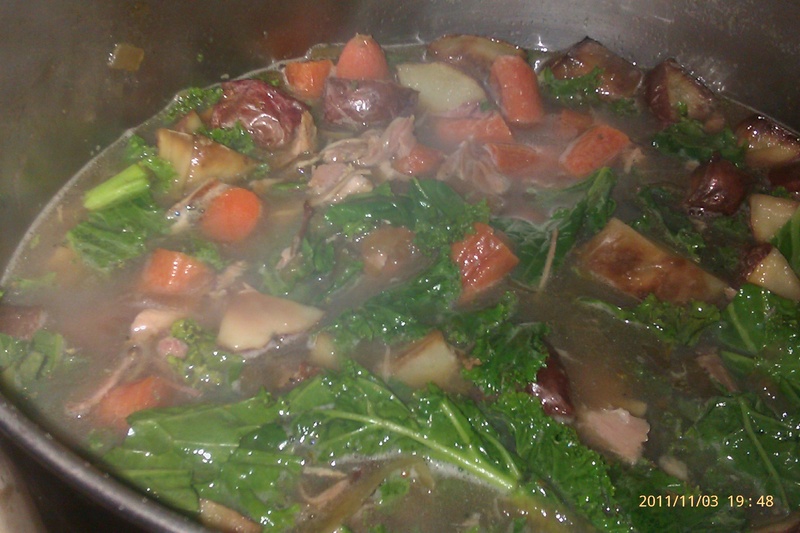 Also, there is virtually no fat on the stock. It’s kind of hard to see in the picture above, but there’s only about a 1/16th inch layer of fat in the jar (if that). 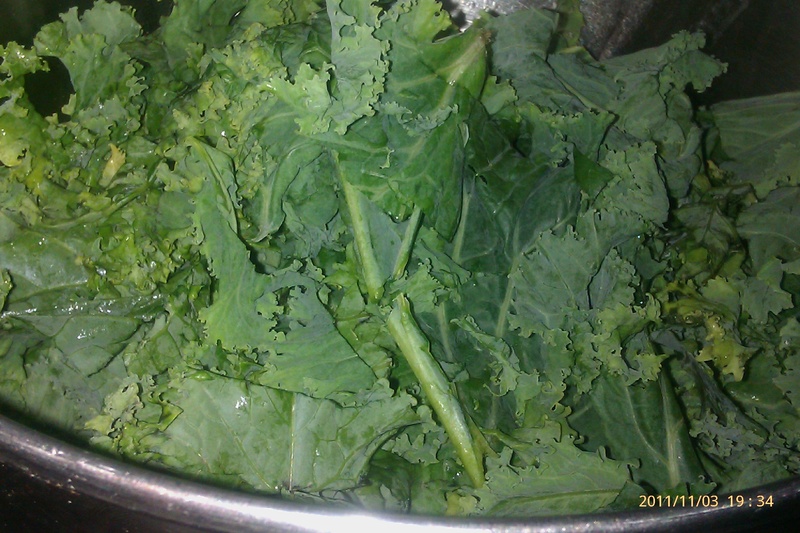 I also happened to have a bunch of kale in the fridge, so I destemmed that (the stems got chopped up and will go the chickens in the morning) and gave the leaves a quick chop. A few minutes all together in the pot with some spices, and this is what I ended up with. And yes, it tastes as good as it looks! So, why was I up early today? I am a night owl through and through. It’s nothing for me to stay up until 1 or 2 in the morning, and since I’m not going into work I usually get up about 9 am. Today, my feet hit the ground at 6:15. Yuck! It was still dark, and even the cats couldn’t believe it. But I had to be at the radiology center for an isotope injection at 6:45. The tech did a good stick (which is hard on me since I have veins that would discourage me from ever becoming a junkie were I so inclined), then I got to go away for a couple of hours and drink a lot of water. Came back and got to spend a half hour motionless on my back, on a hard table with my arms over my head while they took pictures and did a quick CT. Not pleasant given the state of my lower back, and it was a bit hard on my left shoulder too (the one I had surgery on a few months ago). Won’t know the results for two weeks, since that was the quickest the doctor’s office could get me back in. I’m seeing the doc tomorrow for a cortisone shot in my hip, but I don’t know if he’ll have seen the results by then. I’m not holding out much hope for the shot, since cortisone didn’t work on my shoulder or my back, but it’s a hoop that the insurance requires me to jump through. On a high note, I had entered an e-mail contest from my radio station and I got notified late this afternoon that I won! The local Big Brothers/Big Sisters organization is having a fund-raiser comedy show that a friend of mine is headlining. I really wanted to go see him, but tickets were $100 each and that is so not in the budget. I won a pair of them, so a friend and I are gonna paint the town red on Saturday night. Can’t wait! I think about friendship quite a bit. I have a very limited view about what actually constitutes a real friend: could I call this person at 3:00 am and ask a favor? Not many people reach that benchmark, and I’m ok with that. I have lots of acquaintances, but only a few people in my life that I know I can truly call on in an emergency. I can count them on one hand, and I am very grateful for each and every one of them. They are my chosen sisters, and they are very special people. Yesterday I had a quick visit with my PA. Work needed more paperwork filled out to continue my Leave of Absence and I don’t think it is fair to her to just drop off the papers and expect her to fill them out for free, so I schedule a visit so that she can bill the insurance for her time. Plus it gives me a chance to make sure that my records are up to date with all the specialist info, and this time I also got my flu shot. We actually had a very nice visit. I love that she never makes me feel rushed, I feel comfortable discussing everything with her (not always true at the doctor’s office, we all know). We spent a bit of time discussing the sheep, she got to see the socks I’m working on (she’s a fairly newbie knitter), and I got a hug as I left. A good visit. After that I went and got gas for the van and texted one of my real friends. I had planned to go to her house later in the day to go with her to her doctor visit. The reply I got concerned me (she was really freaking out over the lab results her doctor was going to give her), so I rearranged my day, quickly went home and fed the sheep, then headed up to her house way earlier than I had originally planned. We just sat and talked, and I did my best to reassure her. She has avoided going to the doctor for decades and was truly terrified about what the blood test results would be. Several friends have been diagnosed with cancer, and every hypochondriac fiber in her body was screaming that she was next. I believe that knowledge is power, and tried to be as encouraging as possible. After several hours (boy, does time drag when someone is anxious!). The doctor visit was great – all of her test results were well within normal ranges, and her doctor is a very compassionate man, joking with her and arranging for her to see the practices’ shrink in two weeks so that she can learn some techniques for handling her stress. He also talked at length about what a toxic environment our work situation is (most doctors in the area agree), and encouraged her to look for work elsewhere. When he first started talking about work, she actually started getting tight chested and panicking, even though she isn’t scheduled to go back for a few more weeks. And she was a good girl and scheduled a mammogram and a pap in 2 weeks, and I’ve volunteered to go for those too if she needs me. On to Nano. 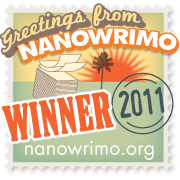 For those that don’t know about it, NaNo is short for National Novel Writing Month. It is an online community for writers (published or not). The goal is to write 50,000 words during November, on a novel that you have not started before November 1st. It works out to approximately 1,700 words a day on average. Not an insurmountable amount of words, but when you figure in the everyday challenges most of us face it definitely is a challenge. Since I’m not working at the moment, I feel like this might finally be the year I finish. I’ve entered the challenge every year, but have never been successful in completing it. Kid the Younger has finished twice, and would have finished one more time but forgot about saving and the computer ate a 40k+ story about November 20th the first year. We never could get the computer to cough it back up, not even Kid the Elder (who is the family computer guru). We are all in this year, so it will be fun to see who gets bragging rights this year. That’s all that’s at stake. There aren’t any prizes to be won, other than a computer button that you can link on your blog, and the satisfaction of knowing you did it. Still two of my blog friends have not only finished but are actually now published authors! Could I join their ranks? We’ll see. I am hopeful. I’m up to 3,140 words already, and the day is young. I’m off to feed the sheep and stir the onions caramalizing on the stove! Getting a bone scan tomorrow, so I have to get up way to early (have to be at the facility at 6:45 for an isotope injection, then wait around for 2 hours before the scan). Have a great day, and enjoy your friends!